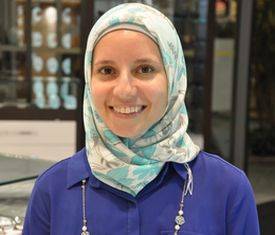 Dr. Sana Al-Imari is a doctor with a great deal of expertise in optometry, and she is excited to help you with everything you and your family need for continued eye and vision health. Dr. Al-Imari holds a BA of Science and a Doctor of Optometry from Pennsylvania College of Optometry, in Philadelphia, Pennsylvania. She practices full-scope optometry, including ocular conditions like glaucoma, cataracts and diabetic retinopathy. She has a special interest in specialty contact lenses, with experience in fitting keratoconic and irregular corneas, as well as experience with orthokeratology for myopia control. Dr. Al-Imari grew up in Mississauga, where she still lives today. She is very active, enjoying many outdoor activities such as biking, hiking and running. She is also fluent in Arabic.